I was pointing out that the accurites in my testing (yes I have a calibration source and a few science grade thermometers) are not accurate at all. The best of the three I owned was slightly under 2ºF high. I have tested others that were 2ºF low so basically all over the board. The mod you suggest is likely to add what half to two degrees different again. I would expect what ? 1 degree maybe 2 if there is in expert handling? Fair? Add the pre existing error, you, in theory could have created 1-5º off of correct.In theory it could be going the right way, and make it more accurate or worse up to 4ºF low if it was the best of my personal ones, or more than 5ºF if it is the worst of the three I owned. No matter what you may think it is still a micro resistance being measured and ANY change is a change calibrated or not at least if you modded a accurate one you could expect a typical +/-2º error. I think that you should have mentioned that the accuracy should be tested before, and after the mod. People often do not have enough experience to make fully informed opinions. Clearly you do understand that you change is GOING to make a DIFFERENCE to the accuracy of the un modded version and YOU decided it was not important to mention that in the absolutely worst case 5ºF off of true. I just thought it was important to mention that a reading might actually be much higher or lower than what is shown... Wire choice, length, and solder choice, not to mention dirt dust and debris present all make a difference. I was not bashing, I think it is still quite polite and simply pointing out that the readings are going to change and that it is something to keep in mind when altering a existing design the original designed operational specs no longer apply. It really is a moot point as the wired units are discontinued by accurite anyway. As a note and a disclaimer for the MOD in this Sticky, I do not rely exclusively on my digital temp sensors that I modified in this tutorial for my enclosures, (they are for basic reference only). I have used (and continue to use) a digital infrared temp gun from Reptile Basics to check, monitor and compare my temperature gradients several times per week. I do not recommend relying on enclosure only sensors, as they can malfunction or provide less than ideal accuracy. My Herpstat Pro continuously maintains and proportionally adjusts the temperatures in all of my enclosures 24-7. My enclosure sensors are used for quick reference in easy to see real time readings that are also compared to my Herpstat Pro. I can glance at them when changing the water daily and if something looks off or different, I can check the enclosure with my infrared gun to verify that everything is ok, or if something is indeed out of whack. It is my recommendation that you employ as many fail-safes and backups for your husbandry as possible. There are ways to do it affordably and without spending unnecessary money, which is why this was posted in this DIY forum section. Good luck every one and keep your imaginations alive! I just completed this mod on TWO of the same exact model. Check it I even took some pix as well!!! I just did this mod and it is the first time I have every used a soldering iron and the unit works perfectly. Check it before you start and after you finish to be sure you didn't make it more inaccurate than it started. Checking it against a suspect thermometer is not very useful. Am I missing something?? Where is the additional wiring coming from for this mod? 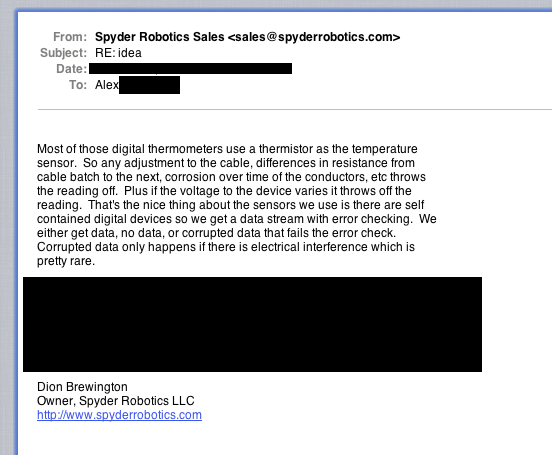 The internal humidity and temp probes dont have wires of their own once taken off....so what sort of wiring are ppl using? About to try this mod myself and want to make sure I understand everythign first! All times are GMT -4. The time now is 06:22 PM.